Very much a morning mushroom, this pallid little grassland conecap rarely survives beyond mid afternoon on sunny days, as the stems quickly collapse and the caps turn brown and rot away. Triggered by heavy rainshowers, these very pointed caps shine like white stars in a green sky. Close-cropped grassland such as lawns, golf courses, parks and dune slacks seems to suit them best, but they can also appear on leaf litter, sawdust and woodchip mulch. Common synonyms include Conocybe lactea and Conocybe albipes. The Milky Conecaps shown above were photographed on our lawn in Wales, UK, while those shown below were found growing on a lawn beside the Madison River in Montana USA. 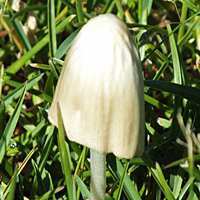 Very common and widespread in Britain and Ireland as well as other countries in Europe, the Milky Conecap is also common in North America where it is sometimes referred to as the White Dunce Cap. It is possible that although very similar the European and American forms may be separate species. When in 1821 the great Swedish mycologist Elias Magnus Fries described the Milky Conecap he named it Agaricus apalus. (In the early days of fungal taxonomy most gilled mushrooms were placed in the Agaricus genus, which has since been spread across many genera, leaving in Agaricus only the 'true mushrooms'.) In 2003 Dutch mycologist Eef Arnolds gave this grassland mushroom its currently-accepted scientific name Conocybe apala. 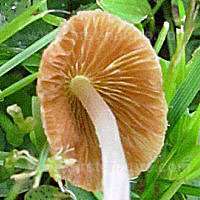 Synonyms of Conocybe apala include Conocybe lateritia, Agaricus tener Sowerby, Agaricus apalus Fr., Mycena tenera(Sowerby) Gray, Bolbitius tener (Sowerby) Berk. & Broome, Bolbitius albipes G.H. Otth, Bolbitius lacteus J.B.E. Lange, Galera apala (Fr.) Sacc., Conocybe lactea (J. E. Lange) Métrod, Galera lactea J. E. Lange, and Conocybe albipes Hauskn. The generic name Conocybe comes from the Latin Conus meaning a cone, and cybe meaning a head - hence Conehead. Less obviously from its appearance by most apt for the fragile nature of this mushroom, the specific epithet apala comes also from Latin and means soft or tender: it is quite difficult to pick up a Milky Conecap without breaking it. 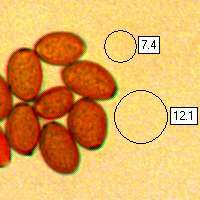 0.8 to 1.5cm in diameter, the elongated caps are sharply conical and often become bell-shaped shortly before collapsing. The surface is not viscid; smooth but often with radial wrinkles; milky white, eventually turning pale beige, with a weakly-lined margin. The cap flesh is very thin and often splits from the edge. The Milky Conecap has adnexed or just free gills. Initially pale ochre, the moderately spaced gills soon become rust coloured as the spores mature. Stems of Conocybe apala are 2 to 3mm in diameter and 3 to 6cm long, white with a cream tint; slightly granular near the apex and covered in fine down below. The slender stem, which has no ring, is extremely fragile. Ellipsoidal, 11-14 x 6.5-9μm; thick-walled, with a broad apical germ pore. 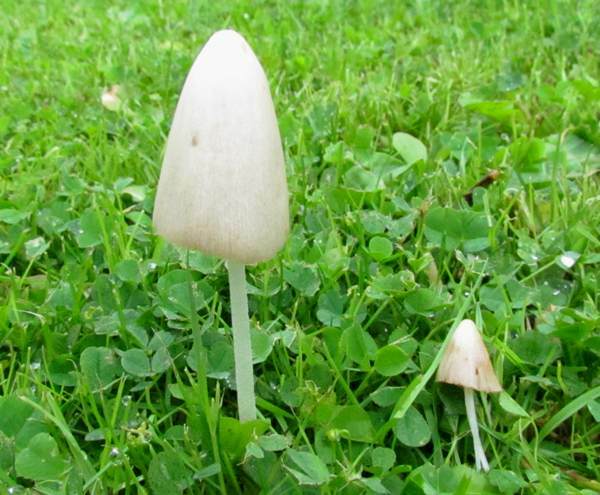 Saprobic, appearing on lawns, in parks and on other close-cropped grassland, occasionally on woodchip mulch; following rain, and lasting less than 24 hours. Bolbitius titubans has a bright yellow viscid egg-shaped cap when young, and it rapidly turns pale buff when fully mature. With its small size and very thin flesh, this delicate and very fragile mushroom is hardly likely to tempt fungiphages into gathering it to make a risotto or a mushroom pie. 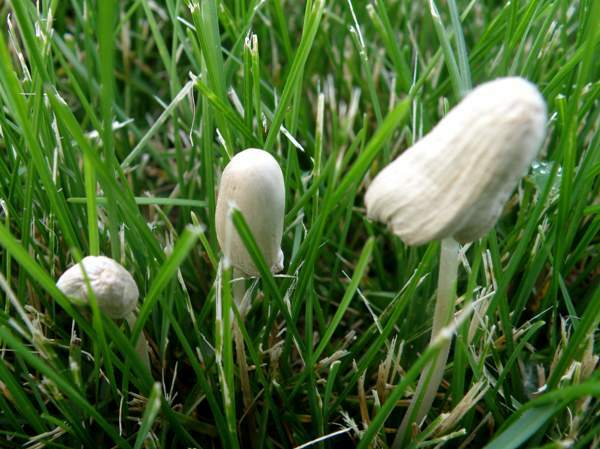 In any case some Conocybe species are known to contain the same deadly toxins that make the Deathcap Amanita phalloides such a terribly toxic toadstool, and so Conocybe apala is probably best considered 'suspect' and left for the lawnmower. Needless to say, therefore, we have no recipe information for this species. Watling, R. (1982). British Fungus Flora: Agarics and Boleti. Vol 3. Bolbitiaceae: Agrocybe, Bolbitius, & Conocybe. Royal Botanic Garden, Edinburgh, Scotland. Funga Nordica, Henning Knudsen and Jan Vesterholt, 2008.